China could soon expand its involvement in peace and security issues in Africa, according to government officials, researchers and academics from both the Asian giant and resource-rich continent who met at the second China-Africa Think Tanks Forum in Ethiopia. China’s President Hu Jintao announced two months ago that his country would invest 20 billion dollars more in Africa. 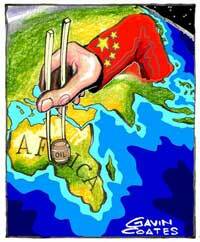 But he also stated that China would take new measures to support the cause for peace and development in Africa. Policies are already being drafted to indicate how China will improve is participation.